We all know that a well-maintained yard lends significant curb appeal to your home. However, creating that magazine worthy lawn and garden is no easy feat! 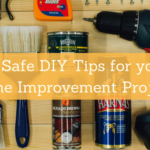 With creative thinking and some online video tutorials, a lot of homeowners have been able to revamp their properties while staying on a tight budget. Even modest gardens and backyards can be transformed into picturesque oases. 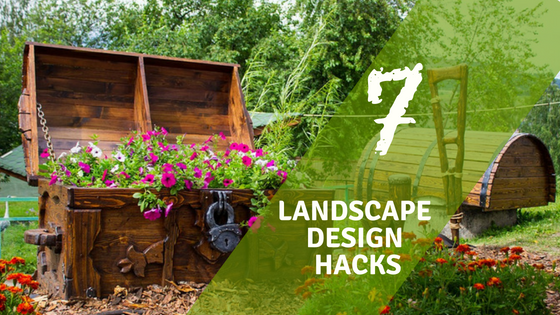 If you want to save some time, effort, and money, and let’s face it, who doesn’t, then we’ve got some landscape design hacks you can use! And you didn’t hear it from us, but professional landscapers are known to use some of these tools and techniques. You read that right! 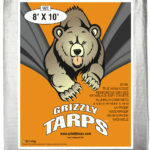 Did you know you can use a tarp to move debris like weeds and leaves around? Use it for the back of the truck when driving home from the nursery. Finally, you can use it to hold soil when digging a hole and avoid getting any on the grass. For a budget-friendly, and not to mention natural, way to get rid of pesky weeds, all you need is some basic kitchen essentials. Just fill a pot with water, bring it to a boil, and then dump the water on any offending plants! The hot liquid should do the trick and kill them instantly. This is an especially useful hack for weeds that love to grow in cracks or joints on the patio or driveway. The only thing to remember here is to grab some good mosquito spray in order to escape possible bites and complications. Do you want a pristine lawn year-round? How about cutting down on lawn mowing duties? Install lush-looking artificial grass instead of the real deal! You will have yourself a gorgeous looking lawn that never needs to be watered. As a bonus for dog owners, your turf will look amazing and never be subject to the digging and mud tracking that pets are wont to do. There’s nothing more gorgeous than riotous color throughout your garden. However, too many flowering plants have short bloom times. And even the perennials have a short lifespan. But here’s a hack that will keep your garden in constant color all year round. Plant a mix of flowering bulbs like lilies and snowdrops. Since these bloom at different times, you will only have to plant them once a year. Voila! Your garden will look splendid from spring to fall! Well, not you, specifically… your garden! When you give your garden a well-defined edge, it keeps things looking tidy and increases curb appeal. It also allows for easier maintenance and provide you with flexibility in making changes to the landscape. However, since we know that stone borders are expensive, here’s a hack that’s available to you: wood borders. A wooden border is as simple as using pretreated pine boards. They are inexpensive, easy to cut and readily available. All you have to do is outline the perimeter of the garden bed and then wedge in lengths of wood to create the edge… and presto! If your garden has some sloped sections, then you know how tricky it can be to make them look good. They are difficult to mow and erode quickly from exposure to wind and water. And let’s not even go into building retaining walls or terracing; the costs build up fast! But we’ve got a hack to help you out: ground covers. If you plant some English ivy, periwinkle, or even some dead nettle, they will help hold the soil in place because of how quickly and densely they can grow. Yes, it makes sense – trust us. If you bag up and send leaves off to a landfill, you’re missing out! Instead, you can mow small quantities into the lawn. This will provide a light dose of fertilizer for the grass and food for earthworms. You can use a leaf shredding blower/vac to grind up fall leaves and use them as mulch. Add them to the compost pile. Or you can till them into a vegetable garden before planting winter cover crops. So, as we said before, leaves the leaves! If you put these tricks and hacks to work, not only will your yard be the best on the block, you’ll soon have our neighbors asking about your landscaper! Now, if you want to share the secret of your beautiful looking lawn, that’s up to you. We won’t say anything… promise! Do you have any tips or hacks you’d like to share? Let us know in the comments!